﻿﻿﻿﻿﻿﻿﻿A primer on how to get your kayak to go where you want. 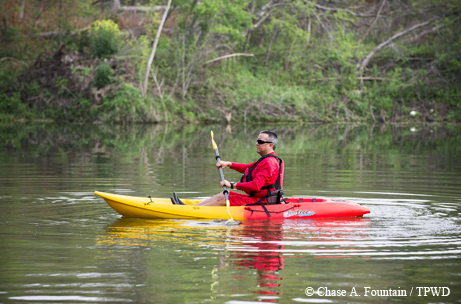 At kayak class, after donning life jackets and launching, kayakers typically learn four basic strokes that every paddler should know. In my classes, we always start with the backward stroke, or “stop.” This way, once you learn how to go forward, you’ll be able to stop, rather than float away. Practice these four basic strokes, and before you know it, you will be having a great time on the water! BEFORE YOU BEGIN: Start by sitting up straight in the kayak, with your nose over your belly button, your knees slightly bent and your feet against the foot rests. Hold the paddle with a soft grip at shoulder width, elbows at a right angle. Twist your torso for your strokes to preserve your stamina. STOP: To stop your kayak, simply plant your paddle blade into the water in an upright position right at or just behind your hip. To stop more quickly, push forward in short strokes and repeat. Plant to either the left or right side of your boat, and if your momentum begins to turn the boat in that direction, simply switch your “brake” to the opposite side. Repeat this pattern until your boat has come to a complete stop. REVERSE: To paddle in reverse, use the back side of the paddle blade. 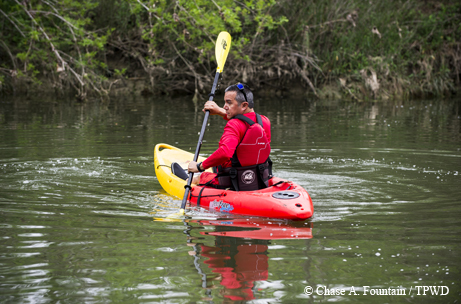 Look over either shoulder, reach back and plant the paddle directly alongside the kayak. Next, press down and forward as you follow through with your entire body. Switch to the opposite side and repeat. 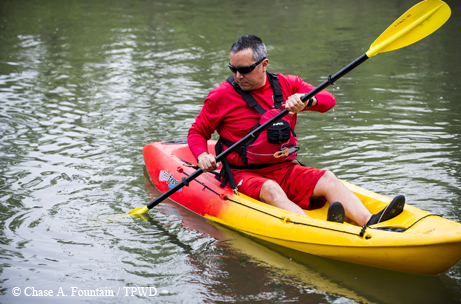 When paddling in reverse, it’s important to look over your shoulder and keep the paddle blade close and perpendicular to the kayak in order to avoid inadvertently turning the boat or rocking from side to side. Practice makes perfect until you can execute a smooth and straight reverse paddle maneuver. TURN: Once you know how to stop and go backward, you can practice turning. 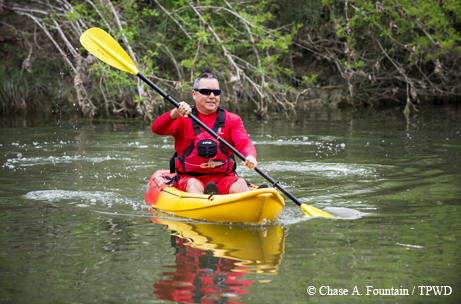 The most common stroke to turn a kayak is the sweep. 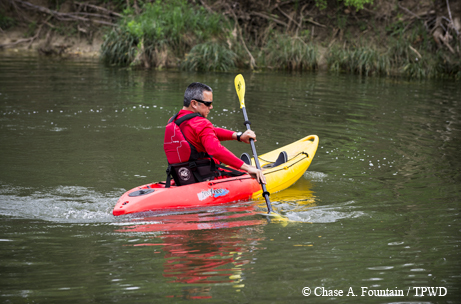 To execute the sweep, rotate the torso, lean forward and place the blade near the side of the kayak at the bow. Push the concave side (power face) of the blade out and in a wide arcing motion away from the kayak and then all the way back to the stern. Rotate your torso through the entire stroke. When the blade reaches the stern, lift and return it to the bow and repeat as necessary to complete the turn. Avoid leaning into your stroke, but rather turn your head and torso. FORWARD: To execute the forward stroke, begin by sitting up with good posture, holding your arms resting comfortably at your side with a right angle at the elbows and a soft grip on the shaft. Press your feet against the foot rests to provide additional leverage while you execute the stroke. Then, fully submerge the blade, power side back, in the water adjacent to your feet about 18 to 24 inches outside of the kayak. Experiment with which placement works for you, as too close results in lost power and too far out causes the kayak to turn. You will get a feel for what works for you. Your goal is to propel the bow forward in a smooth, straight line. Practice keeping a relaxed grip on the shaft and then using your entire body, smoothly rotating with the motion, as you push the paddle blade backward. At the end of the stroke, just behind your hip, lift the blade out of the water, then repeat with the other blade on the opposite side. Easy does it — try for smooth, efficient strokes to maximize power, and don’t forget to press on the foot pegs for added leverage in your stroke.